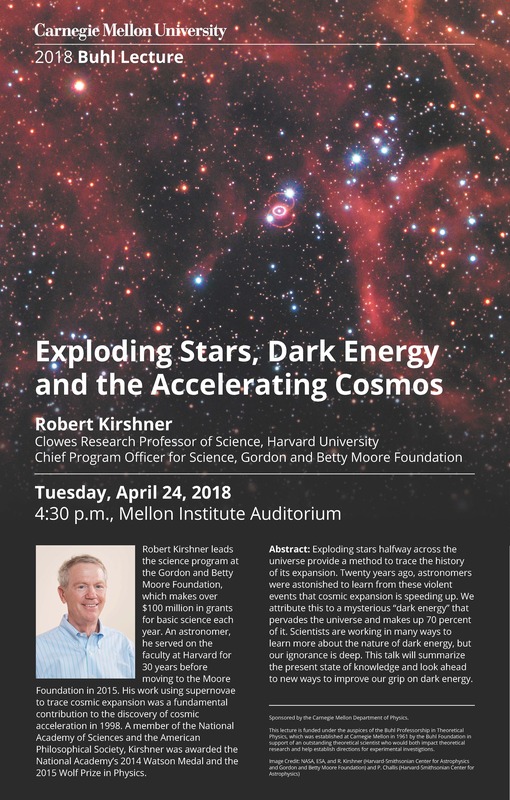 Mellon College of Science › News & Events - Mellon College of Science › MCS News of 2018 › Robert Kirshner to Present 2018 Buhl Lecture "Exploding Stars, Dark Energy and the Accelerating Cosmos"
Astronomer Robert Kirshner will present Carnegie Mellon University's annual Buhl Lecture at 4:30 p.m., Tuesday, April 24 in the Mellon Institute Auditorium. His lecture, "Exploding Stars, Dark Energy and the Accelerating Cosmos," is free and open to the public. Kirshner's research using supernovae to trace cosmic expansion was instrumental to the discovery of cosmic acceleration in 1998. Now, two decades later, Kirshner's lecture will discuss what is presently known about this acceleration and the mysterious yet omnipresent dark energy that is believed to drive that acceleration. Kirshner will also discuss how scientists could possibly better understand the nature of dark energy. Kirshner is the chief program officer for science for the George and Betty Moore Foundation, where he oversees the distribution of more than $100 million in grants annually for basic scientific research. He is also the Clowes Professor of Science Emeritus at Harvard University, where he served on the faculty for three decades and chaired the university's Department of Astronomy. Kirshner's research focused on observing supernovae through a variety of tools, including the Hubble Space Telescope, the MMT Observatory, the Whipple Observatory and the Magellan Telescopes. Kirshner is a member of the National Academy of Sciences and the American Philosophical Society, and his awards include the National Academy's 2014 Watson Medal, the 2015 Wolf Prize in Physics, the Dannie Heineman Prize in Astrophysics and the Gruber Prize in Cosmology. The Buhl Lecture is funded under the auspices of the Buhl Professorship in Theoretical Physics and sponsored by the Department of Physics. The Buhl Foundation established the professorship in 1961 to support an outstanding theoretical scientist who would both impact theoretical research and help establish directions for experimental investigations. Fred Gilman has held this chair since 1995. He revived the Buhl Lecture in 1996, bringing a series of internationally recognized scientists to Carnegie Mellon for public lectures.